TORONTO, ON, January 26, 2017 – Fundata Canada Inc. is pleased to announce the winners of the Fundata FundGrade A+ Award for 2016. This year, 57 companies representing a total of 263 Canadian investment funds received the A+ Award at Fundata’s annual “Evening of Excellence” held on Wednesday, January 25, 2017, at the Art Gallery of Ontario in Toronto. The FundGrade A+ Award is given annually to investment funds and managers who have shown consistent, outstanding, risk-adjusted performance through the year. The FundGrade A+ Award provides investors, advisors, and fund managers with a single, reliable, easy-to-understand fund-performance rating based on up to 10 years of history. Receiving the A+ Award for 2016 were 179 mutual funds, 35 exchange-traded funds (ETFs), 46 segregated funds, and 3 Responsible Investing funds. 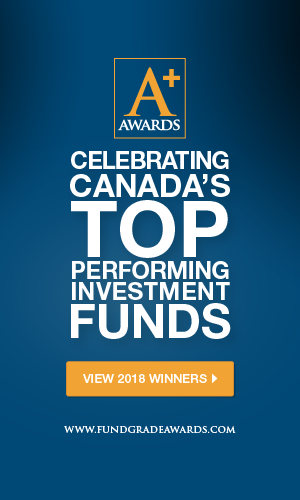 “Because of its objective, highly rigorous methodology, the A+ Award is given to only a small number of funds,” said Janny Vincent, President and CEO of Fundata Canada Inc. “This elite group comprises only 6.6% of the total universe of eligible mutual funds, segregated funds, and ETFs tracked by Fundata,” she added. The FundGrade A+ Rating is a purely quantitative award system, using a totally objective, transparent, score-based calculation to arrive at a grade-point average that ranks funds to determine the annual “best-of-the-best” investment fund ratings. Segregated funds are ranked separately. The top-performing funds with a responsible investing mandate were honoured separately, with a winner from each of the Equity, Balanced, and Fixed Income categories. The investment fund industry is a crucial component of Canadians’ net worth. With $1.33 trillion in assets under management, the mutual fund industry accounts for more than a third of Canadians’ financial wealth. And the ETF industry continues to grow, reaching a new high of $113.6 billion in assets under management in 2016. “We feel that singling out Canada’s top investment funds with the FundGrade A+ Rating allows investors and advisors to easily identify the best of the best over the past year,” said Ms. Vincent. “Fundata Canada takes pride in the fact that over the past five years, the FundGrade A+ Award has been accepted and embraced by our industry as a truly objective, independent mark of distinction for those funds and fund managers who receive the award,” she added. For more information and a complete list of the funds receiving the Fundata FundGrade A+ Rating for the calendar year 2016, please visit www.fundgradeawards.com . Fundata Canada Inc. has been providing data aggregation and dissemination services to the Canadian media and financial marketplace since 1987. Fundata is a major provider in the distribution of fund and stock information in Canada. Our database contains data on over 35,000 investment fund products. Fundata provides customized data feeds, top-shelf analytics, cutting-edge software tools, and seamless hosted web solutions for fund companies, back office systems, investment planners, banks, trust companies, resellers and redistributors, and online, print, and broadcast media channels.